In a previous post, I discussed increasing profit through upgrades. The next step is to wrap analysis around the process to further increase your profit. Once you have the foundation of dynamic pricing you can gather data on selections the users opt for to help drive your gap prices. With configurators, customers can build what they want and for analysis you need to capture what they start with, too. This data should be stored on the order or somehow associated with the final configuration so you can do this analysis. For example, let’s continue our example from before with System X. The product manager wants to increase profit on upgrades and doesn’t know where to start. He now has the order stream that includes the starting point configuration of either Good, Better, or Best and also has the actual configuration that was ordered. From here, the product manager can get a frequency distribution of the selected options by starting point. In this case the product manager knows the hard drive has the lowest cost per upgrade and highest profit per upgrade, so she gets the frequency distribution of hard drives. This is straightforward to do in a database as you can create a query that finds the frequency of a particular entry with respect to the base system. You can also pull the data into an analytics product like SAS or you can code a perl/python script to do the work. Once she has the data, the product manager sees that roughly 65% of the time, the base hard drive is selected across all systems. Interestingly, though, as you escalate up the chain, the attach rate for the higher end systems is greater for the higher capacity hard drives. In this fictional scenario, the product manager would like to increase the attach rate for the 750GB hard drive which is accepted on average 15% of the time. To do this, the she will need to experiment with prices of the 750GB hard drive. She decides to do the experiment over a 3 week period with a different price point for each week as shown in the table below. She figures that since there is only a $10 cost difference between the 500GB and 750GB hard drives, there is still a good margin improvement from additional sales on the 750GB hard drive. She sets up a discount of $5 off the first week, $25 off the second week, and $15 off the third week. After the price experiment, the product manager gathers the results to do some preliminary analysis. In the first week with only a $5 discount, she sees an uptick of about 2% on the 750GB hard drive. The second week increase is more significant with a $25 discount. And the third week was in between with only a $15 discount. As expected, the drop in price bumped the uptake of the 750GB hard drive. 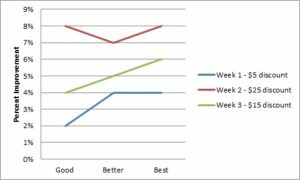 Below is a simple chart of percentage increase by week for each configuration. When seeing this, she assumes that the Week 2 discount would yield the best results. But without margin analysis, the chart would give her the wrong guidance. She then calculates the aggregate margin normalized against the first week’s sales to show which price point performed the best with respect to margin. She now realizes that the simple $5 discount yields the most profit. When performing the analysis, you’re not looking for a 100% optimal price, you’re looking for a good price that you can tweak to improve your profitability. When we proposed this before, we suggested running an ongoing test where a percentage of the population was presented with varying discounts on the target hard drive. Then, the product manager could receive weekly reports on the performance at different prices. Of course this is fictional data, but it is based on our observations in the industry. The analysis is straightforward and approachable for practically any product manager. The reports are easy enough that IT can generate them where they can be opened in Excel to get started, then codified in something more permanent later.